Like Derek Redmond, if he knit. And if he had needed another two months to finish his race. 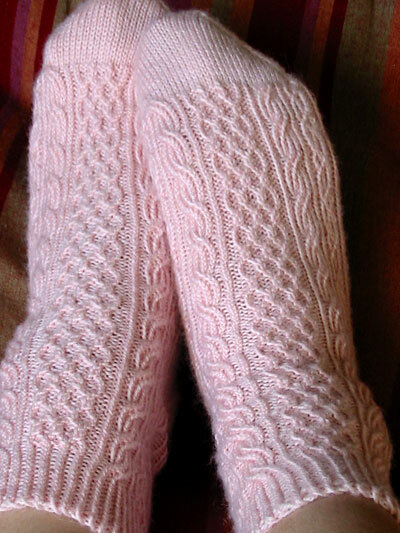 The Bayerische socks, with their tiny, twisty cables, are done. Eunny’s design is, as usual, impeccable, with twisted ribs flowing gracefully into cables which flow gracefully into the slipped stitches of the heel. The sock is very stretchy and should comfortably accommodate a wide foot. I worked two pattern repeats for the leg to make ankle socks. 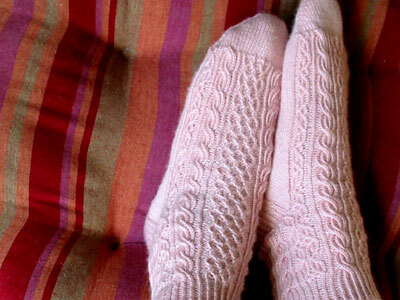 Four-and-a-half pattern repeats over the length of the foot fit my size 7N feet perfectly. I will be heading to Japan at the end of this week and plan to check out a yarn shop or two. I imagine the knitter’s-eye view of Japan to be a cross between Mochimochi Land and a candy store. If candy were made of yarn. Stay tuned for my report! 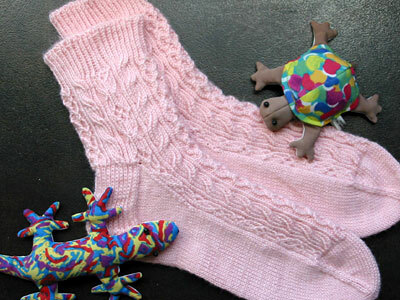 CogKnition posted this on October 18th, 2008 @ 5:54pm in Finished Objects, Socks & Slippers | Permalink to "Bayerische Socks"
Those socks are gorgeous. Another pattern to add to my queue.